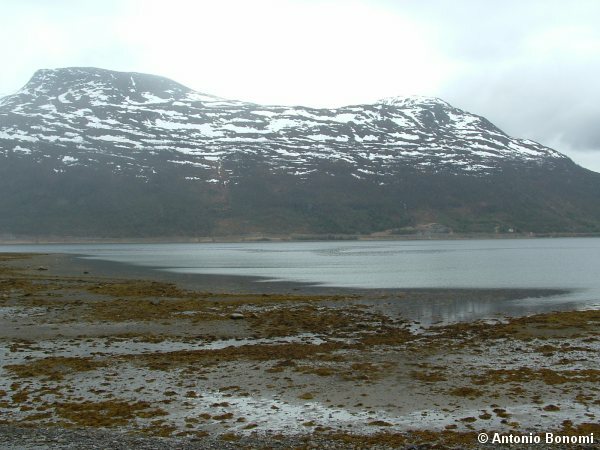 here the complete view of the Altafjord, than the KaaFjord and the LangFjord that are part of it. 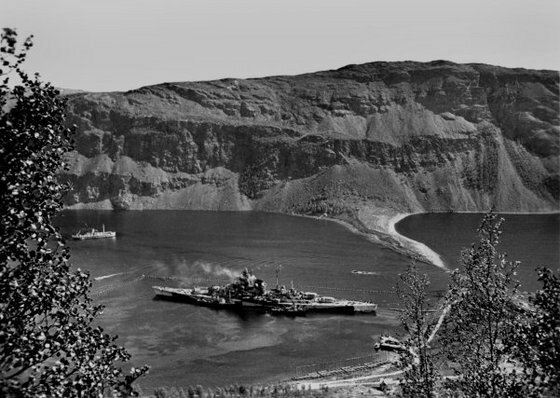 Tirpitz, Scharnhorst, Adm Hipper, Adm Scheer, Lutzow, destroyers, support ships, U-boote and so on, it was a KM Naval base. 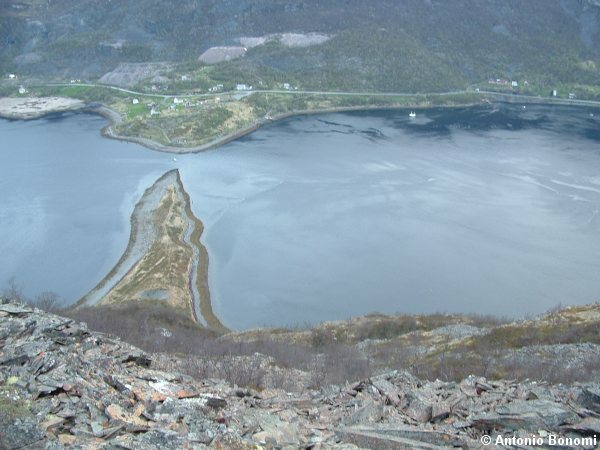 and click on Alta, than zoom up and down on the last 2 Fjords on the left inside of the AltaFjord that are the LangFjord followed by the KaaFjord. 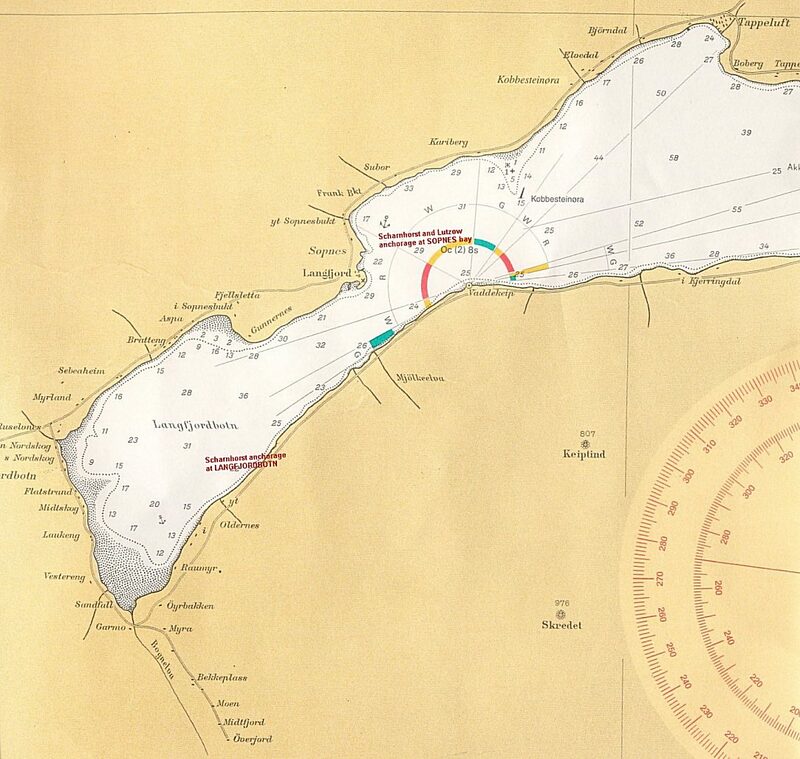 Then you can compare to the original naval maps and see where the ships were anchored as well as their way to the open sea to North Cape and the Artic Convoys. This map is the complete AltaFjord with the KaaFjord on the center-bottom and the LangFjord on the left. The city of Alta is on the bottom right. Here a bigger scale detail of the KaaFjord ( reference above anchorage places 3-Auskarneset or Oskarneset, 4-Barbrudalen , 5-LongStraumsneset and 6-Center-KaaFjord ). And this is a bigger scale detail of the last part of the LangFjord, referencing AltaFjord map above anchorages 1-Sopnes and 2-LangFjordBotn. Last edited by Antonio Bonomi on Sun Dec 25, 2005 10:43 am, edited 3 times in total. For any KM warship lover a visit to those fantastic places is mandatory, now with airplanes ( very low cost of transportation by airplane in Norway ) it is easy and fast. 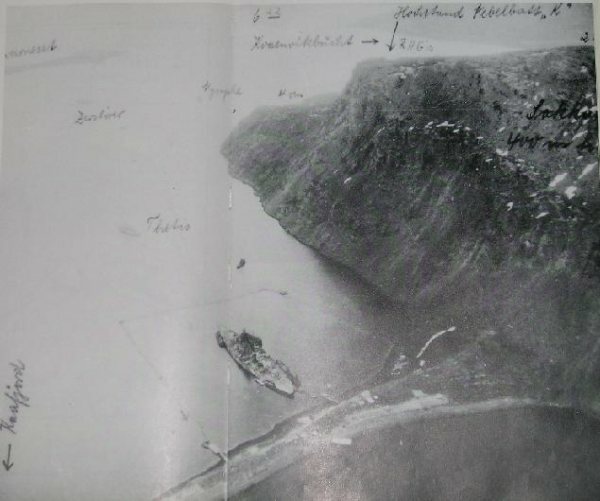 If you look at the KaaFjord map, on the left side, you can read ' KaaFjord KPL ' , with a cross sign, that is the KaaFjord church, with a small cemetery were the X-Craft crew members that died on the attack are buried. 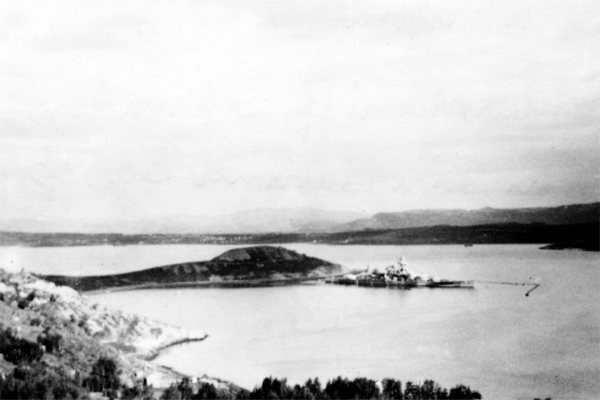 Just 50 meters after on the right inside you can see a group of houses, the TIRPITZ ALTA MUSEUM is in there. You will find very warm and friendly persons, something to drink and to eat while you visit a fantastic museum dedicated to this ship and to his history. It is for Germans, British and Norwegians, all the ones that did had a role on the ship history, visitors will enjoy the tour. 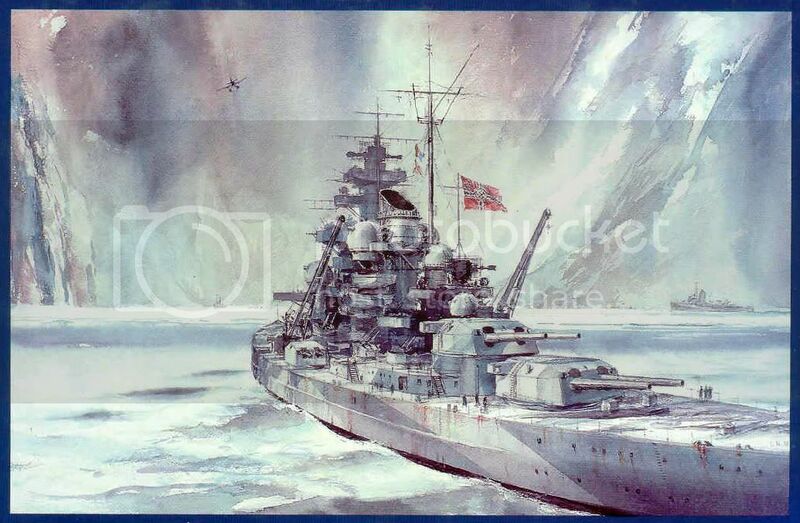 Than you can see on the last room, my 14 models so the full collection of Kriegsmarine warships with all the correct Norwegian camouflages painted on them. Surely I'll go there one day. among the various anchorages, probably the less known were the LangFjord one's, at least to me. 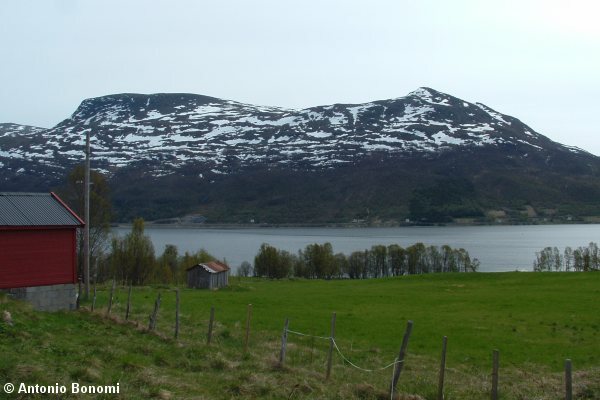 That is why before my Norway trip I have studied all the places and the photos I had very carefully, looking at all the mountain profiles to find them out once there. 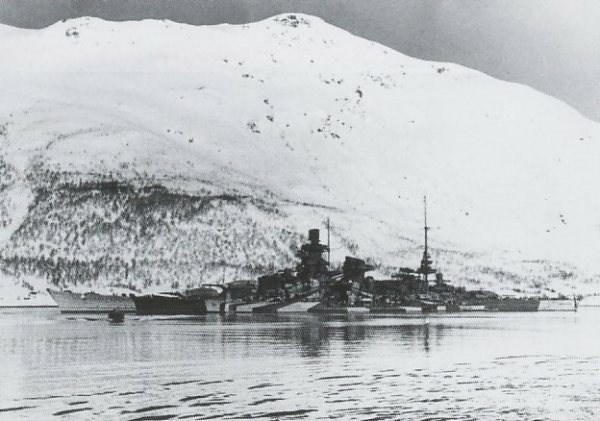 Here you can see the Scharnhorst anchored at Sopnes bay, at the end of the LangFjord, were the ship was anchored before sailing for her last mission on December 1943 ( but not with this mimetic you see in this photo, with the last one with the mountain profiles ). and compare the mountain profile with this June 2004 taken photo. 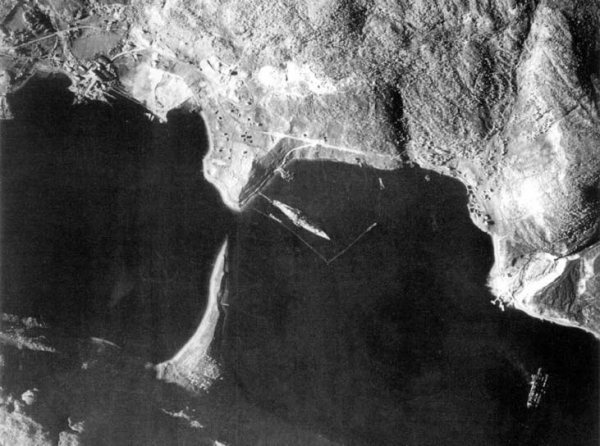 Scharnhorst and Lutzow were permanently moved here in after the X-Craft attack to Tirpitz on September 1943, but as you can see the anchorages were used before as well during 1943. Thanking my friend Even I had the chance to do that in AltaFjord and into KaaFjord ( otherwise you cannot reach the LongStraumsneset peninsula were I made a nice discovery I will tell you after when I will cover the KaaFjord anchorages ). You can imagine the feeling, .. it is a different perspective. 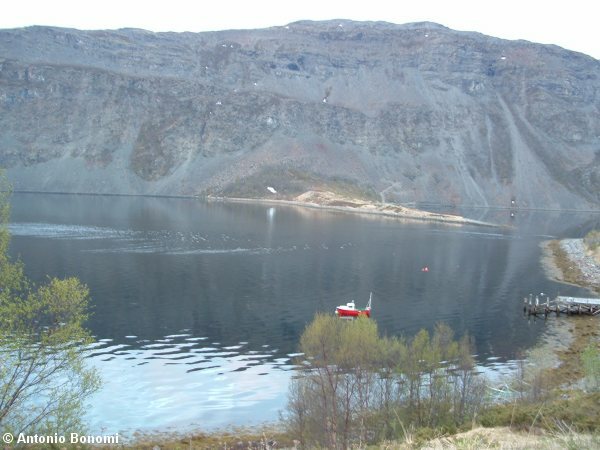 Than I climbed the Sakkobadne mountain too ( it is the mountain on the right of the KaaFjord ), to be able to take photos from the top of the KaaFjord anchorages. 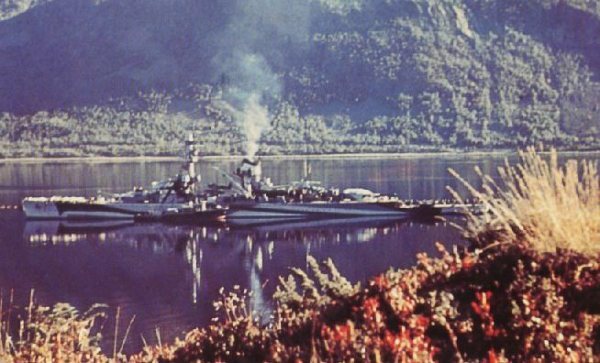 I am sure in KaaFjord my friend Even ( the Tirpitz Alta Museum responsible ) is thinking about that type of possibilities on the close future . In FaettenFjord we rented a small boat to get close to the concrete blocks, it is there always available. In Tromso we rented a small airplane, and we flew on top of the Tirpitz sinking place simulating the last part of the Lancaster attack lane. If one wants to do it,.. do it,.. it is easy and funny . That was a good idea indeed! 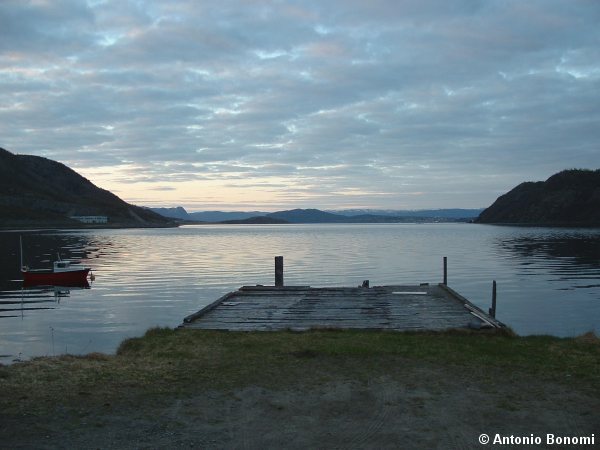 here the Lutzow photos is LangFjord at the Sopnes anchorage. 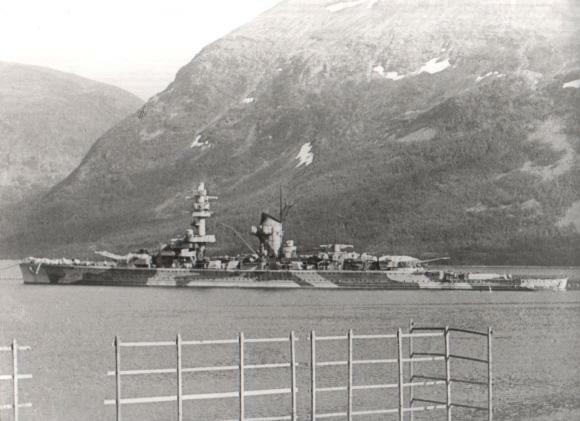 You can refer the mountain profile behind the ship with the current photo posted above for Scharnhorst. Here a fantastic Lutzow photo in colour with a camo scheme called HUSAR camouflage. 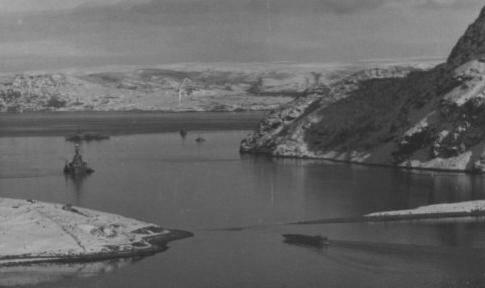 First the Auskarneset peninsula one used by Scharnhorst and Lutzow, on the right inside entering the KaaFjord. Than we can move on the Center KaaFjord one here seen from Straumsneset peninsula with Auskarneset on the left end. 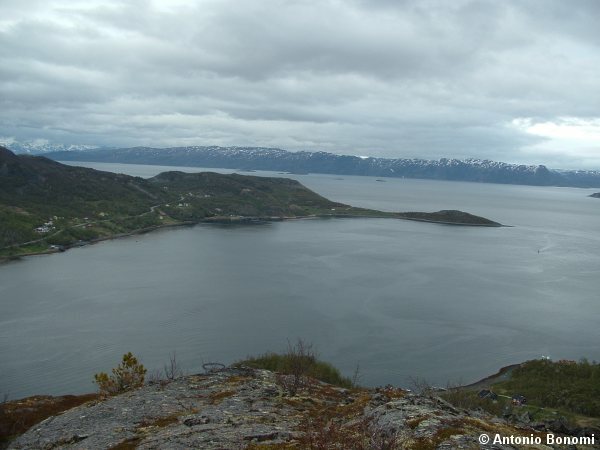 Moving inside the KaaFjord we reach the last 2 anchorages used mainly by Tirpitz. Here a closer look of the same photo. On that peninsula on 2004 we have found the evidence of an anchor buried in there. 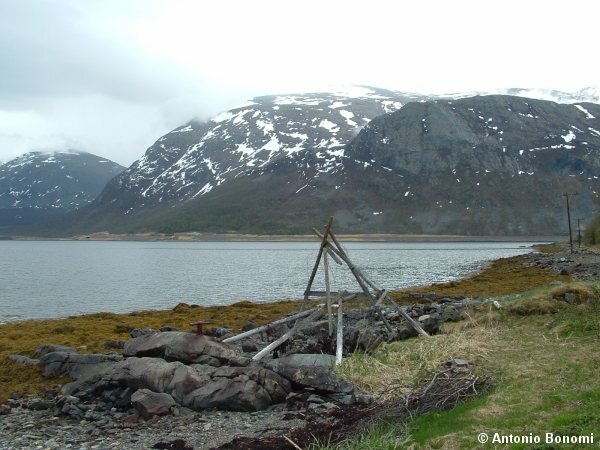 The anchor has been taken out of the ground and now Even has placed it at the entrance of the Tirpitz Alta Museum. The very famous Imperial War Museum Nr. 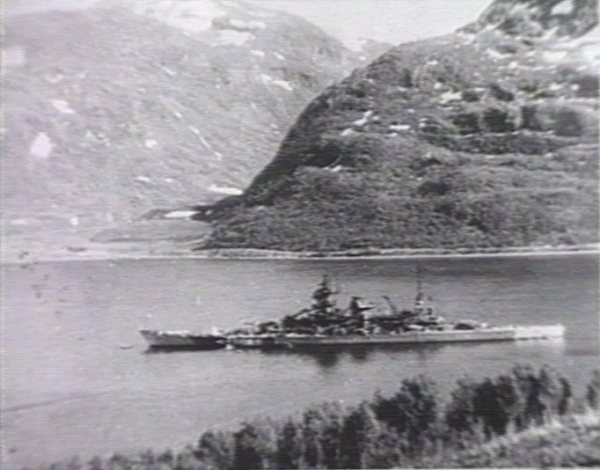 4535 photo taken of Tirpitz anchored on Long Straumsneset peninsula on July 12th, 1944 by a PRU ( Photo Reconneissance Unit ) Mosquito. The ship is under re-painting for the last camo and the deck shows a very strange dazzle camo scheme probably painted to simulate the peninsula colours. 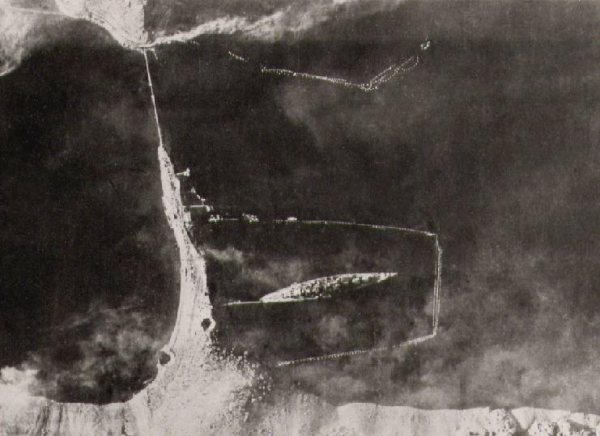 but as you can see on this photo the Lancaster were not going to be confused by that, here the Tirpitz after the Op. 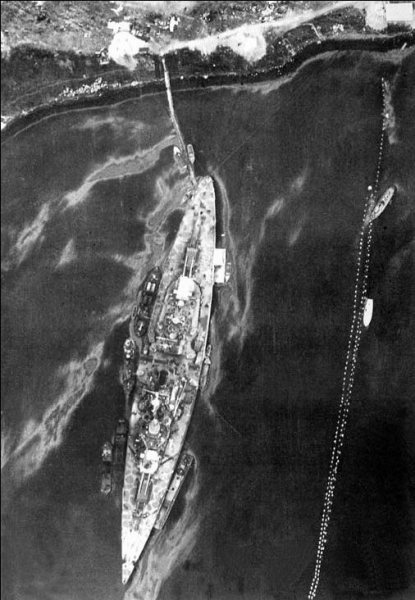 Paravane attack on late September 1944. Hope you have enjoyed the KaaFjord tour and my explanations been clear enough. I thought that many readers of your wonderful translation job of the Tirptz KTB would have liked to see were the places are and how they look to be able to understand more about my favourite ' Lovely Queen of the North ' ( my nickname for Tirpitz ). That is why I asked Jose' to be able to post those maps and photos. Talking about maps they are all properly oriented and YES, the North is always on the top on each of them. 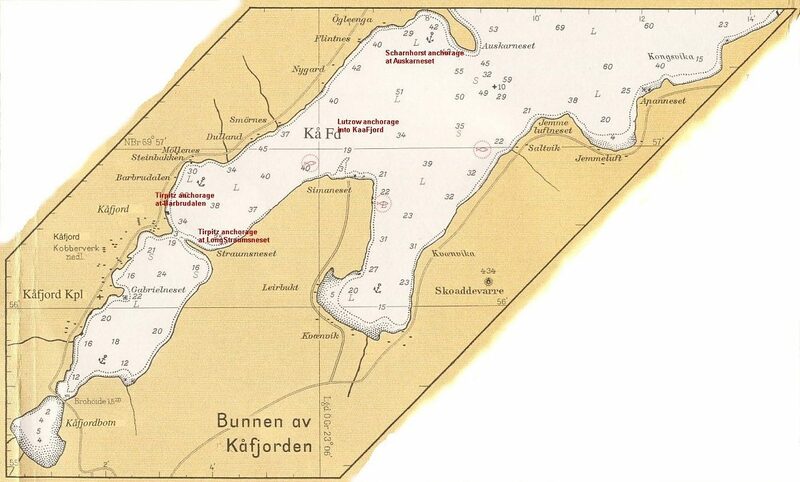 Just correlate the "Bunnen av Kåfjorden" [bottom depth off Kaa Fjord] chart one with the bigger one above her and refer to the bottom part were the anchorages I numbered 3, 4, 5 and 6 are. That is exactly the KaaFjord as well on a smaller scale and now you should be able to recognize the correct orientation and correlation of the 2 charts fairly easily. 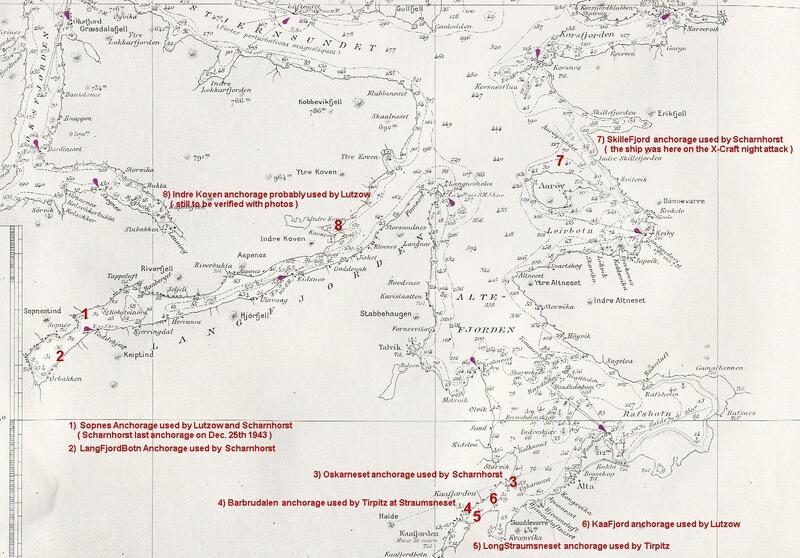 Similarly the anchorages 1 and 2 on teh map above are the one showed on the LangFjord chart detail at the bottom. Hope now it will be easier for everybody. 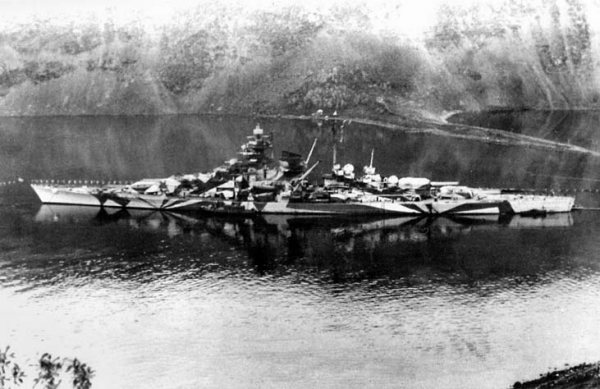 Lovely Queen of the North ' ( my nickname for Tirpitz ). But in this case been Tirpitz my favourite ship as my avatar shows I decided to give her my own ' personalized 'nickname . Isnt she ' lovely' ? Can you imagine that photo taken in colours ? Well I made a model of that camouflage, .... and among 14 ships everybody was looking only at her . YES, she is,.. a beauty, .. so my ' Lovely Queen of the North '. 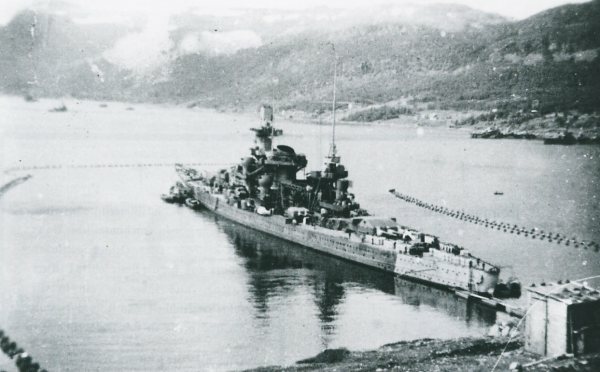 That is why I love that ship since 33 years now, since the day I purchased the Leonce Peillard book about her ( still the best ) and started discovering the Tirpitz and her story. 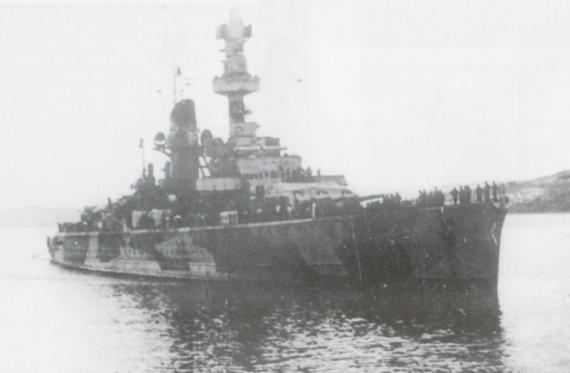 .. now my love for her is stronger than ever, ... and she brought to my life wonderful experiences and sincere friendship too that warms the heart ..
.... that is why despite been a battleship, so a symbol of a past war, ..
.... I will keep on calling her my ' Lovely Queen of the North '. .. and been today Christmas this is a very special message to be delivered to everybody. I always considered her and her sister the most beautiful things men ever built to sail the sea, from the age of five, six years old, when my uncle firstly spoke me about the mighty Bismarck and her chase. Indipendently from their function as battleships...I guess every sailor and sea lover could fall in love for a ship, expecially if that ship played a role in his life. 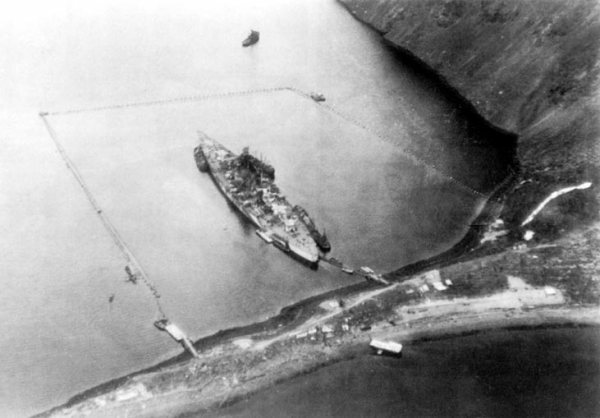 So is not surprising in my eyes that this love is pushing Antonio to complete this massive and important work about Tirpitz anchorages.